Merch Store, teaming up with Amazon, iTunes, Topspin, Songkick and Google Play to help indie musicians on YouTube promote licensed merchandise, music downloads, and concert tickets on their channels. Selling merch isn’t just for musicians, so starting today the Merch Store will become available to all YouTube partners in good standing around the world. We’ve also added another friend from the web for even more great merch—CafePress. 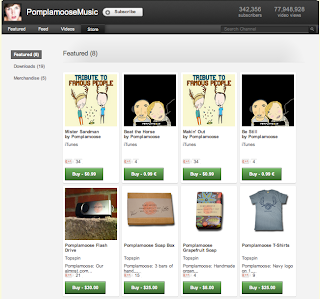 For Merch Store inspiration check out partners like Pomplamoose, Geek & Sundry and DeStorm, and for more information check out our Help Center. We chock YouTube full of features to help turn your YouTube channel into your dream job, and there’s lots of other good folks out there who have similar goals. Last year we launched the Merch Store, teaming up with Amazon, iTunes, Topspin, Songkick and Google Play to help indie musicians on YouTube promote licensed merchandise, music downloads, and concert tickets on their channels. The good connectivity for different types published video shared in which connected in this post and do entertainment in this video. Most of the people are useable site and do enjoy it.